Quenelda has always had a magical bond with dragons, and her greatest wish is to fly one and fight alongside her father in the war against the hobgoblins. Root, on the other hand, wishes only to avoid the fearsome creatures, so the role of Quenelda-s esquire is the last thing he needs. But an unexpected friendship is forged, and when Dragons Dome is besieged by a deadly plot, this unlikely duo must find a way to defeat the dark forces.Epic battles, whispered legends and soaring magic combine in this breathtaking debut fantasy, with black and white illustrations by David Wyatt. It's like Eragon for middle school kids! I enjoyed every moment I spent reading this book. The author is an excellent writer, the subject magnificent and the characters well developed and inspiring. The Dragon Whisperer has a strong female lead character and an unlikely male hero, the perfect pairing for a perfect book! The plot is exciting at times and even a little bit dark. It's great for girls and boys , there's plenty of action to keep everyone interested. 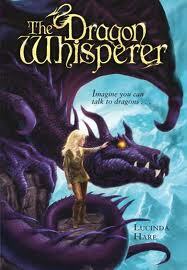 The first of a series, The Dragon Whisperer will prove to be a cult classic. This book sounds great! I'll keep it in mind for when the time comes and my son is old enough to read it(with me :D). I love dragons! This sounds really fantastic! We're reviewing a dragon book at the moment, and this sounds just as captivating and interesting! I guess I should have made my review longer, but seriously, I am anxiously awaiting the next book!